Kaspersky is the first security solution publisher to present its new line of software this year. 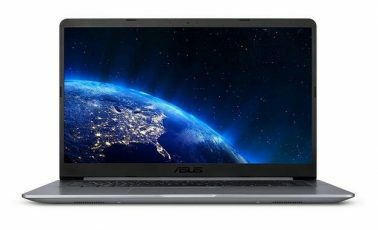 Three products allowing to secure computers and especially the privacy of the users. They are: Kaspersky Antivirus 2017, Kaspersky Internet Security 2017 and Kaspersky Total Security 2017. Thanks to its significant performance and intuitive tools, Kaspersky had managed to place second in our 2016 antivirus comparison. But what about 2017? Will Kaspersky rank among the best suites of security on the market once again? The answer is here, in this Kaspersky Internet Security 2017 test. While Kaspersky Internet Security 2016 was installed without a hitch last year on our test PC, the 2017 edition is another story. Indeed, the download step was completed with ease, however, we encountered an error during the installation step which forced us to restart the computer to start over again. A small hiccup at the start that fortunately did not occur again later. 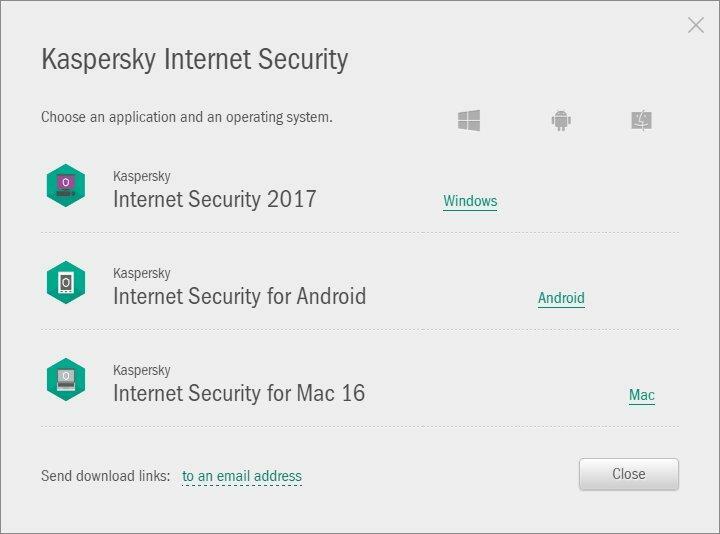 After 10 minutes of patience, we’ve finally got to discovered Kaspersky Internet Security in 2017, and overall there are a lot of similarities with the previous version. First of all, the interface is exactly the same except for one thing: The Privacy Protection and the Protection for all devices tabs were added to last year’s four tabs: Scan, Database Update, Safe Money and Parental Control. 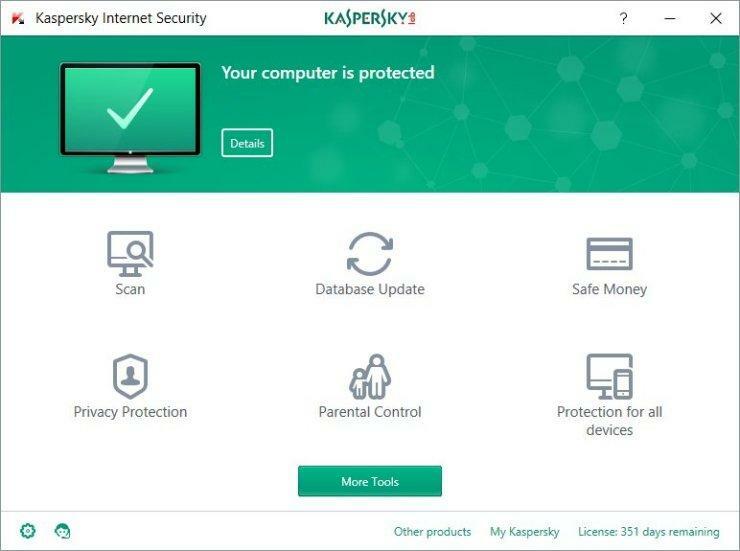 Note: If you download the 30 days trial version of Kaspersky Internet Security do not forget to activate the trial key in the license key window. Without it, you will not be able to access the Parental Control and Safe Money features (which would be a real pity!). Next, by clicking on the More tools button, we find the 2016 version’s Tools menu including the software updater, the software cleaner, the secure connection and all the other options of the security suite. 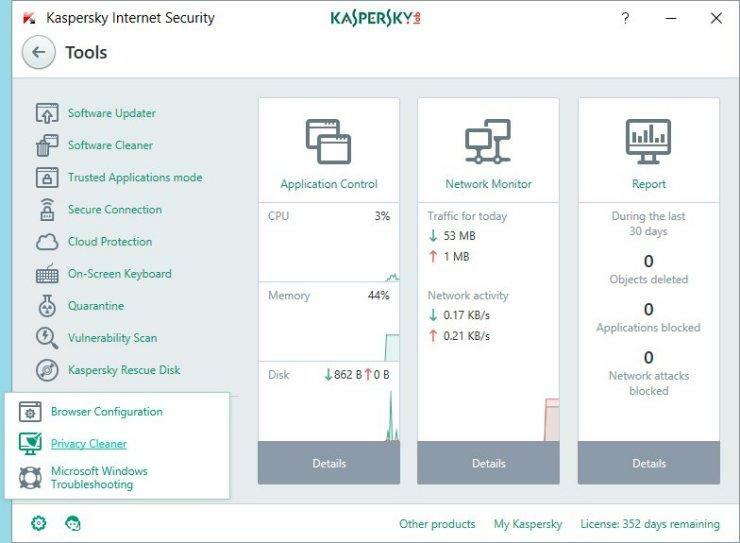 Obviously, Kaspersky kept its control dashboard which displays the running applications in real-time, as well as the current network connections. Tools that are rarely used by novices but are always welcome by security savvy users nevertheless. 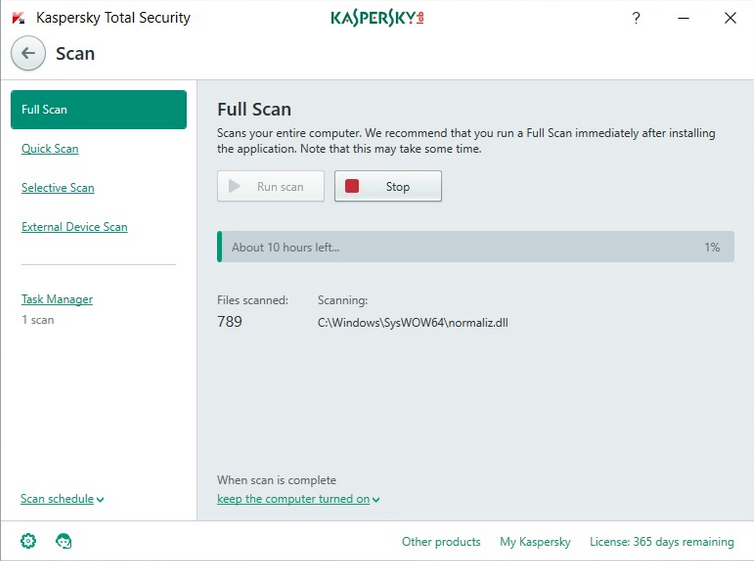 Before exploring the new tools available in the 2017 version of Kaspersky Internet security, we chose to directly test the antivirus detection ability of the software. So, we started with the analysis of a USB stick. The fast analysis found nothing malicious, besides an advertising program that was automatically blocked. After this little interlude, we moved on to the serious business, which is the full scan of the PC. An analysis which proved positive but which took a considerable amount of time. When the analysis started, the software indicated 1 day remaining, then 9 hours. But ultimately, it was after an hour that we were able to get the result which was conclusive. In fact, Kaspersky Internet Security 2017 has detected more than 1200 threats. A hundred of which were directly processed by the security suite, while the remaining 1000 threats have been put in quarantine. Just to be sure, we removed those files in order to preserve the security of our computer. Now let’s move on to the new additions, with the Privacy Protection Features, first. 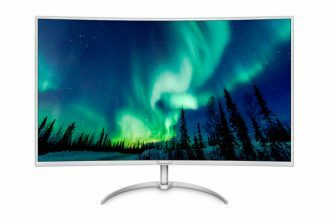 It offers two different options: deny webcam access, and enable private browsing. The first module is quite complicated to test since it requires the installation of spy software that records what is happening on the computer in order to spy on the user. Which we chose not to do. Nevertheless, the option seems really interesting and allows users to have some protection from prying eyes notably during their navigation on social networks. It’s a real ally for the parents who can use this option in addition to the parental control. Meanwhile, the data collection prevention module has a double advantage. The first is ensuring safe internet surfing by preventing any site from collecting your confidential data while surfing the internet. The second is that it protects you from malicious programs and thus from being invaded by ads coming from the visited websites. Really interesting tools which in addition to the existing add-block option, integrated into the browser, became a lot more useful. Note: Attention, by default, Kaspersky allows the collection of the users’ data by its site and its partners’ sites. Don’t forget to uncheck the box in the options to provide additional security, and avoid receiving spam. 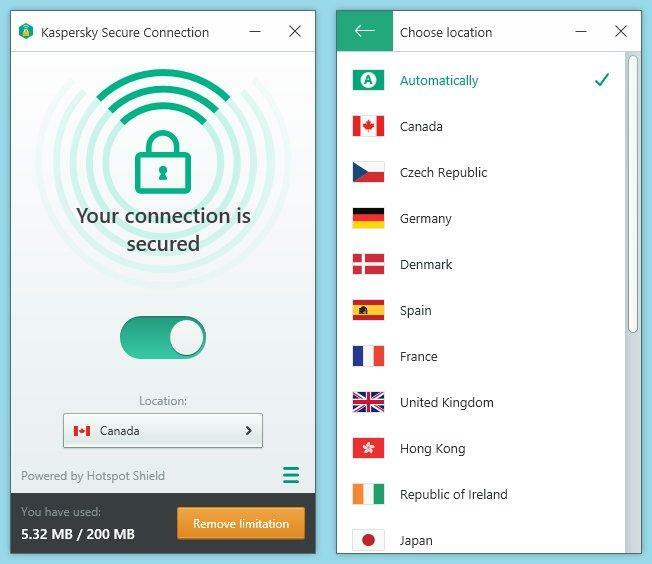 On the other hand, there is a new addition which can easily be missed but did not escaped our attention, it’s the VPN integrated into Kaspersky, also called Kaspersky Secure Connection. It’s a real novelty that will make a lot of Kaspersky’s users happy. It allows to surf the Web anonymously, (By using a third-party IP). We did a test by using the SpeedTest website, and we have noticed that it located us in the Netherlands, more specifically in Amsterdam (which is of course completely wrong). It’s a strong addition that brings an added value to Kaspersky’s 2017 edition. In addition, while the free version of the VPN allows the use of 200 MB per day, the user has always the possibility to increase this rate by opting for a paid version, which is still cheaper than a subscription to another VPN. We conclude with two tools that we quite rightly convinced last year, namely, the parental control and the banking protection. There aren’t any particular changes despite a few improvements, particularly for the multi-level protection of financial transactions of the banking protection module, avoiding data collection through key logger type programs. An additional level of protection is preferably welcome at these times when hackers discover even more innovative solutions to deceive their victims. However, restarting the computer in order to activate the virtual keyboard during its first use is still unfortunate. It’s undeniable that Kaspersky Internet Security is one of the best security suites available in the market, and the 2017 edition is yet an added evidence. This year, the security publisher has decided to play the proximity card by facilitating its customers with an additional personal security. This has contributed to an addition of the security suite with a privacy protection module and a VPN which reassures to both, the digital identity of users. The PC on the other hand benefits from an extremely sophisticated viral solution enabling the detection and prevention of threats. However, a few slight technical drawbacks have been detected during our tests, leaving a bitter taste in everyone’s mouth. Should it be interesting to discover new features every year, using them efficiently and safely is still a necessity.